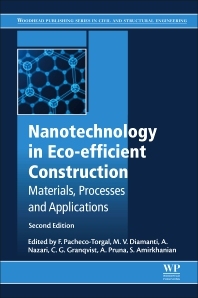 Covering the latest technologies, Nanotechnology in eco-efficient construction provides an authoritative guide to the role of nanotechnology in the development of eco-efficient construction materials and sustainable construction. The book contains a special focus on applications concerning concrete and cement, as nanotechnology is driving significant development in concrete technologies. The new edition has 14 new chapters, including 3 new parts: Mortars and concrete related applications; Applications for pavements and other structural materials; and Toxicity, safety handling and environmental impacts. Civil engineers requiring an understanding of eco-efficient construction materials, as well as researchers and architects within any field of nanotechnology, eco-efficient materials or the construction industry will find this updated reference to be highly valuable. Maria Vittoria Diamanti is an Assistant Professor in the Department of Chemistry, Materials and Chemical Engineering at the Polytechnic of Milan, Italy. Her current research interests are: titanium oxides, nanostructured surfaces, photocatalysis, self-cleaning surfaces, spectrophotometry and reflectometry, corrosion, and durability of reinforced concrete. Claes Goran-Granqvist is Professor in the Department of Engineering Science at Uppsala University, Sweden. Professor Granqvist's research is focused on optical and electrical properties of materials, especially thin films for energy efficiency and solar energy utilization. He has published around 730 research papers in mostly refereed journals, over 30 books, had invited conference presentations at about 250 international conferences and chaired about 30 international meetings. A. Pruna is a Scientific Researcher in the Center for Surface Science and Nanotechnology at Polytechnic University of Bucharest, Romania. Her current research interests are: ZnO nanomaterials, graphene-based nanomaterials, conducting polymers, photocatalysis, corrosion, electrochemical sensing, supercapacitors. Dr. Serji Amirkhanian is a Professor of Civil Engineering at the University of Alabama, Tuscaloosa, USA. He was the Mays Professor of Transportation and the Director of the Asphalt Rubber Technology Services (ARTS) in the Department of Civil Engineering at Clemson University until June of 2010, before he started his international consulting activities. He is also an Adjunct Research Faculty at UNLV and an Adjunct Professor at Arizona State University (ASU). In addition, he is an Adjunct Faculty at IIT Madras (India) and a professor of Civil Engineering at Wuhan University of Technology (Wuhan, China). Dr. Amirkhanian started his teaching career in 1987 at Clemson University. The total dollar amount of his research and teaching the DOT certification courses contracts exceeded $25 million. His research has resulted in over 250 refereed journal papers, conference papers and research reports. He has also published two book chapters. In addition, he has conducted over 200 presentations around the country and the world presenting his research findings.